And a couple of years ago a team that set off to sail across the arctic in the summer months expected to have difficulty; the same difficulty they had two years previous. They had to turn back because of a preponderance of ice. Well, that didn't happen on their second trip. There was so little ice in the same areas that they sailed across with no difficulty. 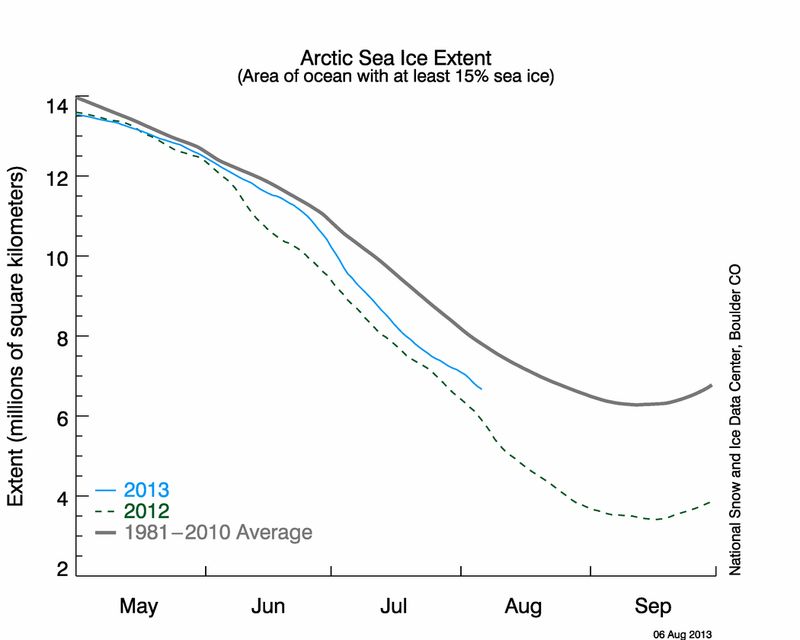 Looks like Arctic Ice is doing OK to me. Global climate change is the more accurate term for the increasingly devastating climate phenomenon affecting the planet. This is exactly what global warming affects, and why it could be disastrous to our planet. Portions of the planet will still receive snow. Portions will still get a$$-freezing cold. Etc. However, when the climate changes, so will the weather. This last winter saw snow fall in portions of the Southern States that generally do not receive snow, or very little of it when they do. Big whoop dee do, you say? Well, the arrival of snow or colder winters in those areas will have disasterous affects on crops. And crops are vital not only to the economy, but to our very existence. That's just an example. THe planet heating up by one or two or five degrees may not seem like a big deal, but keep in mind that the average planetary temp raising this much will greatly affect weather patterns, which in turn will affect climate. Weather is what is happening RIGHT NOW. Climate is the average weather happenings over a period of time (usually the last 20 to 30 years). So maybe if we knew what the Arctic Ice was like 50 tears ago we could see a difference with today. Ice at the North Pole in 1958 and 1959 - not so thick « Watts Up With That? Wow look how thin the ice was 50 years ago. Maybe sooner or later people will catch on that all this global warming hysteria is just a way to grab more money from the people. Oh and calling it global climate change is just a cop-out so the scientist pushing this don't look so stupid when life goes on just fine. Name 3 clear signs of the coming Thermageddon « Watts Up With That? The people in the Catlin Arctic Survey are running out of food because the weather is so bad they can't get a re-supply flight in. There claims of thinner Ice in the arctic don't hold up either. And if you are worried about Antarctica, it is a nice toasty -91F there at the Vostok station today. Wow look how thin the ice was 50 years ago. Maybe sooner or later people will catch on that all this global warming hysteria is just a way to grab more money from the people. You are using pictures from fifty years ago to prove your point!? That is just as ridiculous as someone using the movie An Inconvenient Truth to prove that global warming is happening. Neither is valid for an argument. As for the thin ice...Anomalies happen and the navies of the world have been poking through the arctic ice pack for almost as long as there have been submarines, not to mention ice-breakers have been clearing a path for ships to travel for what, two centuries now. As for the 3 Clear Sings....those comments are based on opinion not fact. There will always be anomalies in weather and like I said previously, even if global warming is happening there will still be areas of the planet that are bum-freezing cold. Oh and calling it global climate change is just a cop-out so the scientist pushing this don't look so stupid when life goes on just fine. 1) Science "facts" that we know of today may be proven wrong tomorrow by new science "facts". This is the scientific process and every formally educated scientists knows this. That is what keeps innovation and thought moving in a forward direction. The only people that will look 'stupid' are those laymen who take everything that they hear on the news as facts. 2) Like I said, weather is what is currently happening right now, climate the weather condition based on the daily average weather over a span of at least two decades. Now, if the average temperature of the planet increases, so will the temp. of the oceans. In case you are not aware of it, weather patterns are directly related to the temperature of the oceans. If the ocean temps raise, then weather patterns would change as well, likewise changing the climate(s). So yes, global warming would be global climate change. Besides, which one sounds less threatening? The pictures prove that the Ice being thin lately is nothing unusual, it has happened in the past before, big deal. Global warming alarmist keep saying these events are unprecedented. Not only did this story by ABC News turn out to be wrong, The Arctic sea Ice extent right now is about the same as the 1979-2000 average. Actually, the story is really 10 myths about Global warming and refutes claims made by the Global warming alarmist. All the claims have references cited. Yes that is true, too bad the earth is actually in a cooling phase now, so all the claims about the temps rising out of control due to Anthropogenic Global warming just don't hold water. The truth is, the climate models being used are no better than a guess. I just read the current issues of some of most respected magazines such as National Geographics and Scientific American. All have articles about the ice melting due to global warming. I believe it. The great thing about the internet is people can research the facts for themselves. Yeah, I know that it is 10 myths, the link is entitled Name 3 Clear Signs...Since I was referring to the link I assumed that you would have made the connection. Watt does refute the ten 'myths', but he does so with opinion. He picks and chooses what to source as fact just as the alarmist do. Any piece of information can be twisted to fit any view-point. For example, I do not believe that gnomes exists, but I sure as heck can create a blog and source countless articles and other information to prove that they do. Anyone can be a spin doctor. Without reading the journal papers that led to articles that he picked through to find supporting evidence for his point of view there is no way of knowing what the original papers were about. Now, before I go any further I should add that I do not necessarily disagree with you. There are definitely some whack-jobs on the alarmist side, just like there are whack-jobs on the other. My issue is when someone form either side blindly accepts something that they read as fact without having any real knowledge of the situation. Is global warming happening? Hell if I know. The problem is that no-one knows for certain. At least 100%. That goes both ways. Just like you claim that there is evidence that global warming is not happening, there is evidence that it is. If it is happening, we are living it. It is happening right now, and thus won't really be able to fully view it until after the fact. If it is happening, I don't wait to until it is too late to find out. You mentioned something to the effect of scientists feeling stupid once they realize that they are wrong. Are you going to feel stupid if it turns out that you are wrong? I put the word fact in quotation marks because once again, I figured you would get what I was alluding to with out having to explain the scientific process. I will stop making assumptions from now one. First of all, it wouldn't be a theory, it would be a law (theories are the currently accepted explanation and is open to the possibility of a future revision when new equipment, testing methods, or understanding make it possible to expand on that theory or prove it wrong. A law is a theory that has been proven to be true time and time again from every possible angle and has been accepted as a universal truth (although there are some new ideas behind the Law of Gravity that is showing what is currently accepted is wrong, but that is science for you). When someone comes up with an idea, they form a hypotheses. This hypothesis, the null hypothesis, is put through a test. During the test you are trying to prove your null hypothesis wrong (test to falsify), so you form an alternative hypothesis (if it is not A, than it is B, and so forth). The hypothesis has to be of a testable nature, so you can't say something like, Global warming is caused by aliens. When you test to falsify you are purposely trying to prove your hypothesis wrong. If you can't prove it wrong, then you are one step closer to it being right (as an aside, this is exactly why you cannot currently use science to prove that God, aliens, ghosts, or gnomes exists because science is currently unable to prove that they do not exists). This process is continued many times until the tester is satisfied that enough tests have been conducted to support the hypothesis. At this point a journal article is written and published in one of the various scientific journals for peer review. Other scientists pick up on it and conduct their own tests. Repeat, numerous times. Once thousands of tests have been performed the hypothesis becomes a theory. But remember, even a theory is still open to revision. Now, with all of that, to my knowledge there is currently no one actively testing to prove global warming is not happening (because they might prove it to be happening in the process? ), instead they are interrupting other data and reports to support their own ideas. Another thing is that there is no one be-all-end-all tests that can be down to prove that global warming is happening. Instead, scientists choose to focus on a certain aspect that would support the idea that global warming is happening. Any one particular aspect is not enough to prove anything, so many smaller tests are done and the data from all of these are collected into one larger context supporting the main idea. Global warming is bull***** and liberal brainwashing to get people to pay carbon taxes.